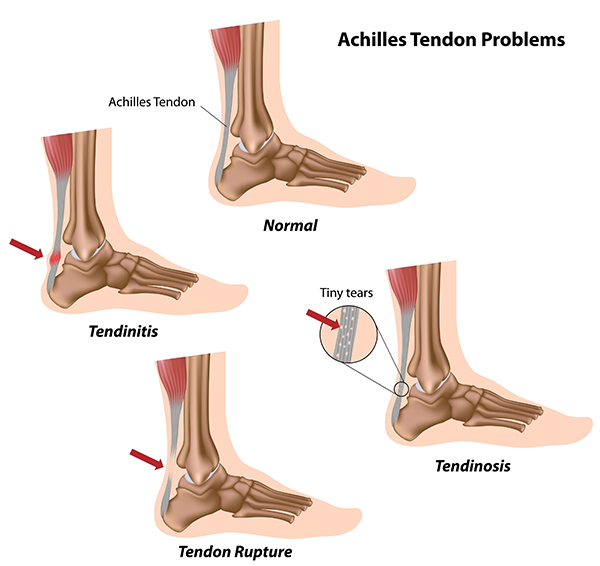 Although we are unsure why certain individuals are more prone to develop this problem than others, there are certain factors, which seem to appear in the “cause” column, Trauma or injury to the Achilles tendon itself is an obvious cause of subsequent tendonitis. An abnormality in the way that one walks or what the medical authorities refer to as improper biomechanics can also create excessive strain upon the Achilles tendon resulting in localized swelling and pain. Over use, excessive training and improper stretching can also result in Achilles tendon injuries. The bottom line though, in most cases of Achilles tendonitis, is the same…pain, reduced range of motion, localized swelling, and a potential long term problem that is usually slowly responsive to therapy.